Protein is one of the commonly used target molecules in various molecular diagnostic fields such as disease diagnosis, pathogen identification, and biosafety. At present, the detection of human blood viral antigens is mostly performed by immunological analysis methods such as enzyme-linked immunosorbent assay, but the sensitivity of these assays is low. To figure out a sensitive, specific method based on the immunoassay technology, we modified the bio-barcode assay (BCA), a new immunoassay technology developed in 2003, using the fluorescence-based quantitative real-time polymerase chain reaction (qPCR) during the detection step instead of scanometric DNA method. Then, we established a qPCR assay for barcode DNA and would apply to the novel BCA of human viruses. A specific plant sequence genetically distant from the human blood viruses was selected from the GenBank as the original version. Based on this sequence, barcode DNA, primers, and TaqMan probes were designed for the novel BCA. The length of barcode DNA was optimized [Figure 1]. After being amplified by PCR, the barcode DNA were cloned into pMD18-T vector, and the products were transformed into DH5α chemically competent Escherichia More Details coli. Positive colonies were identified by ampicillin resistance and colony PCR; then, they were amplified in the Amp + liquid medium. Recombinant plasmids extracted from the positive clones were successfully confirmed with Sal I, BamH I digestion, and sequencing. After the reaction conditions of qPCR were optimized according to the controlling variable method, recombinant plasmids were 10-fold serially diluted as quantitative standards to perform the calibration curves [Figure 2] and [Figure 3]. Finally, the sensitivity and repeatability of the qPCR for detection of barcode DNA were assessed [Figure 3] and [Figure 4]. The barcode DNA sequence was aligned using BLAST at the National Center for Biotechnology Information and showed no homology to any sequences listed in GenBank. These designed oligonucleotide sequences were as follows: 5'-TGC CCA AGC GAA TGT GGA ATT TGC CGA TAG GCC GAT GGT AGG CCA AAC CAG ATT TCC GGT-3'. The specific barcode DNA was obtained to construct the recombinant plasmids. Enzyme digestion was performed to identify the recombinant plasmids, and the matching rate of sequence alignment was 100%. It was determined that the recombinant plasmids of the barcode DNA were successfully constructed. The 25 μl qPCR mixture contained 2.5 μl of PCR buffer, 0.40 μM of each primer, 0.2 μM of TaqMan probe, 2 μl of dNTP mixture, 0.10u/μl of Ex Taq HS, and 1 μl of the recombinant plasmids. The reactions were performed in a TGradient Thermal Cycler programmed for one cycle of 3 min at 95°C, followed by 40 cycles of 10s at 94°C, 10 s at 53°C, and 10 s at 72°C. Initially, the cycle threshold was set with background-based threshold algorithm. In the qPCR assay, 10-fold diluted recombinant plasmids (1 × 109 copies/μl; ~1 × 102 copies/μl) were used as a standard to generate the linear regression, and the linear correlation was 99.5%. 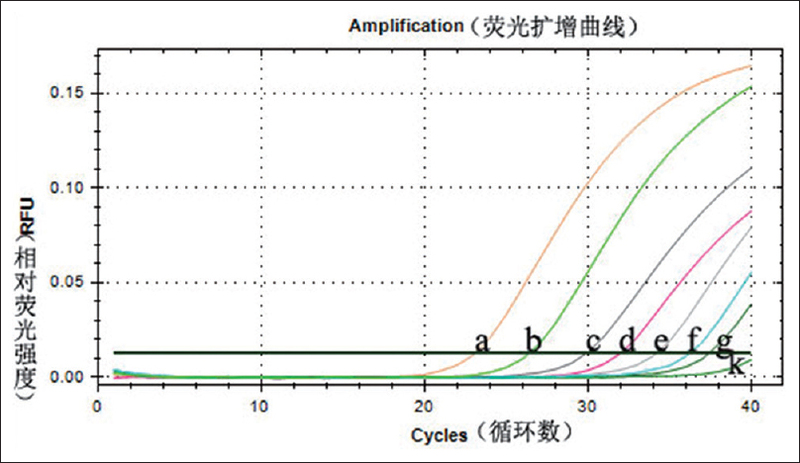 The analytical sensitivity of the qPCR assay was assessed using a 10-fold dilution series of recombinant plasmids ranging from 1 × 100 copies/μl to 1.0 × 106 copies/μl, and the result of the sensitivity was 100 copies/μl. As for the repeatability, the intragroup Coeffecient of Variation (CVs) were <10%, and intergroup CVs were between 4.42% and 39.05%. In the conventional BCA, the scanometric DNA method was less stability and accuracy of detecting the barcode DNA than the qPCR based on the TaqMan probe. The length of barcode DNA is designed to be 60 nt, because it reached the requirements for both qPCR detection and the length of barcode DNA as short as possible in the novel BCA. 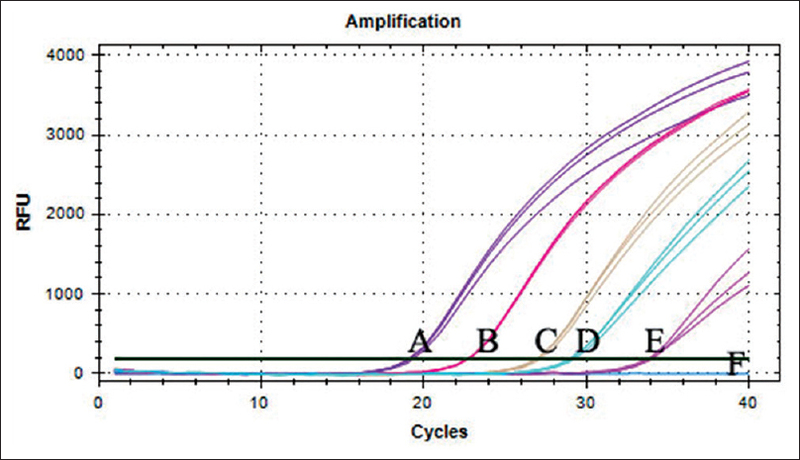 The qPCR for the detection of barcode DNA is established with high sensitivity and good reproducibility, which can be used for the further study of novel BCA [Figure 3] and [Figure 4]. For detailed article log on to: Journal of Clinical Transfusion and Lab Medicine http://www.lcsxyjy.com/EN/10.3969/j.issn.1671-2587.2016.03.019.